Vehicles and vehicle sub-systems are complex. Their development requires the pooling of expertise from many different domains of science and technology as well as tight collaboration between different entities, part of a wide and tiered supply chain. Market forces require a constant reduction of time-to-market while consumers and legislators require a continuous reduction of cost and energy consumption, coupled with improvements in safety and comfort. These influencing factors require a more efficient development process and increased virtualisation is providing tools to achieve this, such as modelling and simulation. 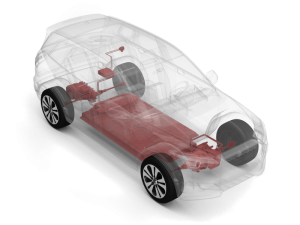 Simulation (“Virtual testing”) has earned its place in the automotive development process as a valuable complement to performing physical tests. Physical tests are time-consuming, costly and of limited use in the early stages of product development when hardware representative of design intent is not yet available. Developments in the past 10 years have made simulation a useful methodology. Co-simulation (the joint execution of a set of component simulation models in order to simulate system behaviour) has been established as part of validation efforts. However, there remain several limitations in the current state-of-the-art that hamper more efficient use, in particular in the earlier stages of system and component development when most degrees of freedom in design can be found. There is no single modelling and simulation environment that can cover all aspects of e-drive/EV development. Many tools are geared towards a single domain (e.g. thermal analysis, magnetic flux simulation or CFD). Some require a high degree of spatial detail and are linked to CAD data while others have their origin in control engineering and electronics and require a high temporal resolution. This diversity of tools and the resulting models has led to a fragmented use of modelling and simulation throughout the EV development cycle: models of physical components are not interchangeable between the different tools used for concept layout, detailed component design, MiL-simulation and hardware validation; concept models cannot be extended as the design matures and they must be recreated from scratch several times during the development cycle; especially for hybrid testing (heterogeneous testing approaches, i.e. where physical prototypes are mixed with simulations in a single test) real-time use requires executable models that are consistent with those created in domainspecific applications. A standard exists (FMI) that allows exchange of executable black-box models—necessary but not sufficient for achieving seamless model transfer, coupling and co-simulation on different levels of detail when starting from a mix of white-box models, all native to different domain-specific applications.